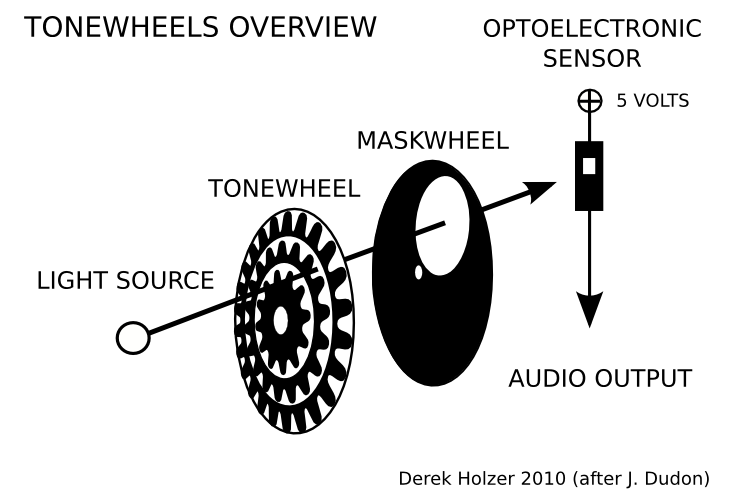 Simple parts are all that are needed to explore optical sound. Using a phototransistor to modulate the voltage from a battery is the simplest method. This can be connected directly to a speaker, or to some types of mixer channels or amps (line level usually). To drive multiple phototransistors with a minimum of crosstalk between the channels, a voltage regulator and a few capacitors can provide a stabilized source of voltage to the transistors. Here, jack cables are used to connect the circuit to a mixer via the line inputs. In order to connect this circuit to many types of audio equipment (mixer inputs, guitar effects, modular synthesizers, etc etc), it is necessary to create an output buffer. Buffers are simple circuits, often using one or more op-amps, which act as the middle-man and help other circuits talk to each other in the the world of electronics. R1 is a potentiometer, which controls the threshold of the op-amp. This means that you can adjust the circuit to the contrast between light and shadow in order to give the strongest signal out. R2 is another potentiometer, which controls the output volume, and C2 is a capacitor which blocks any DC voltage (the constant part of the signal, rather than the part which is AC--the audio part) from going further in the circuit. If you plan to connect this circuit to a mixer, then an output jack can be inserted between C2 and pin 3 of U2, the LM386 amplifier. The LM386 amplifier chip is used to drive either a speaker or a pair of headphones. This amp has a nasty tendency to self-oscillate, meaning that it produces a tone all by itself. This can be prevented by making sure there are no "ground loops" in the circuit. 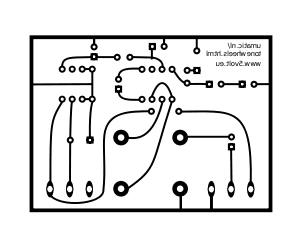 In other words, each connection in the diagram which leads to the bottom-most line has only a single path or wire leading there, instead of several paths to ground. 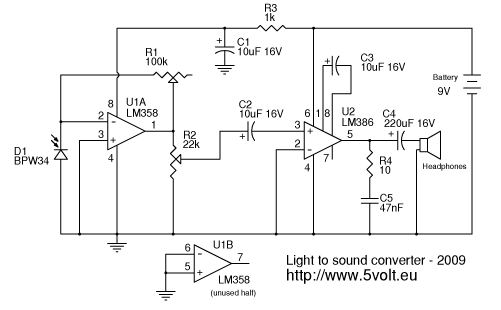 Please see Alex's site for more discussion about this light-to-sound converter. NOTICE: in order to keep the headphone/speaker amp in this circuit from self-oscillating, it may be necessary to make a cut in the copper at the upper left hand corner of the border of the PCB, just next to the printed text when looking at the copper side of the etched board. This is to prevent a ground loop, as mentioned above. This should not be a problem when the jack ouput is used to connect the circuit to a mixer or other device. 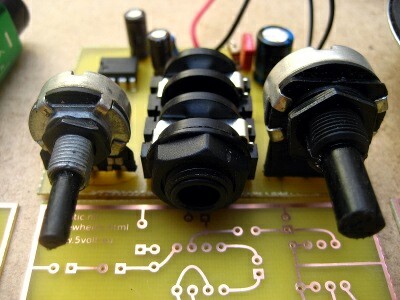 COMING SOON: updated PCB to fix self-oscillation problem of the amplifier. When PCB is updated, I will also include a parts mask here so you know which components go in which holes! Please note that I power this circuit with a 12V wall power supply. It is not recommended to use the same power supply for the motors and the light-to-sound converter, as the motor controller produces a lot of electric noise due to the pulse width modulation of the current to the motor. Silkscreen clarifications: the unlabeled circular pattern near LED1 is a wire jumper and the part labeled FB1 is really R9. Please refer to G. Forrest Cook's site for more information on this circuit. This page is under development for the TONEWHEELS project, as part of a residency at the Tesla media arts laboratory, in Berlin, Germany over the months of Oct-Dec 2007, and at STEIM during the last two weeks of February 2008, and I am grateful for their support. Further technical support was provided by Martin Howse, Jeff Mann and Manfred Fox in Berlin, and Marc Boon in Amsterdam. TONEWHEELS was conceived during the "Kunst & Musik mit dem Tageslichtprojektor" workshop at the Moltkerei (Cologne, DE), organized by Ralph Schreiber, Christian Faubel and Tina Tongerel. TONEWHEELS had it's first full-scale premier at the Passengers International Festival of Public Art (Warsaw, PL).